Postoperative period in hair transplant is generally uneventful. You will not get any major problems that are expected after most other surgeries. After all, here there are no major muscles or any other tissues that are cut, it is only on the skin itself that the entire procedure is done. So the process is quite smooth and there is no major inconvenience. Pain: Painkillers have to be taken in the postoperative period for about three days or so. After that period, usually no further painkillers are needed. Simple NSAID painkillers like Ibuprofen are sufficient to control the pain very effectively and you will not experience any pain with these medicines. 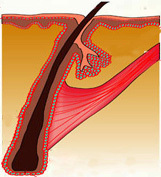 Swelling: Swelling is an inescapable part of hair transplant. Swelling occurs in the forehead which can spread upto the eyelids. Swelling is due to the softness of the skin of the face - during plantation punctures are made into the skin for each hair and it is this that causes the swelling. Swelling can be minimised by using ice. Anti-swelling medicines are also given. The swelling goes down in three days. Discolorations and marks on the skin: The skin has some reddish marks following the operation. Small scabs are also formed around the hair follicles. This will disappear by itself in about two weeks. Itching: Some amount of itching will also occur. This is part of the body's natural process of healing. As the pinpoint pricks heal, they give rise to itching. This occurs mainly from 7 to 10 days after the procedure. Anti-itching drugs will be prescribed which will control the itching during this period. You may wear a cap from the immediate post-operative period. You can go back home immediately after the procedure. It is best to have someone to drive you home after the procedure as driving can be difficult if sedatives are given as in some cases. You will be prescribed four classes of medicines as discussed above: antibiotics, painkillers, anti-swelling medicines and anti-itching medicines. Besides this, you may be prescribed vitamins and also medications for hair loss like minoxidil or finasteride. You will need to keep your transplanted hair moist for a week. You can use a normal saline solution for this which will be prescribed for you or plain drinking water. You can take a bath from the next day and you can also wet your hair from the next day, though you must avoid rubbing or brushing the transplanted area. You will need to shampoo your hair from the fourth day onwards twice weekly with a special shampoo. This helps to remove small scabs and crusts from the scalp. This is to be followed for one month. You can apply an antiseptic ointment to the back of the head, the donor area -this will help in healing. Both the transplanted area and donor area heals in about 5 days. The shafts of hair from the transplanted hairs fall off in about three weeks. This is called 'shock loss'. New hair will start to grow from the follicles planted inside and by three months you will see steady growth - by six months you will see the effect of the transplanted hair and it will make a definite change in your look. It can take 8 to 12 months from the procedure to show its full effect. Once the hair grows, no special care is needed for the hair. It is your own natural hair. You do not any special hair oil or shampoo for it. You can dye it using normal hair dye. You can comb and shape it in any way you choose. You can also shave your head - it will grow back normally.